I have an ultimate love for outdoor living rooms!! 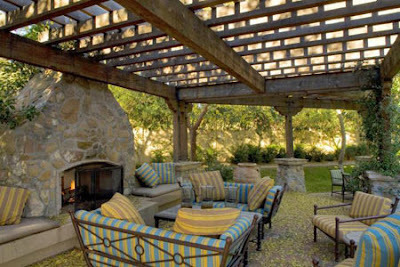 I just LOVE the look of a Pergola in the backyard (as opposed to a gazebo). I think its because the sun still shines in with a Pergola. We have such a short summer season here in Canada and I would love to enjoy it to the fullest with a wonderful outdoor living room!!!! Currently we have a gazebo in part of our yard and of course our above ground inflatable pool. Now I LOVE having the pool but realistically we will only get another year or 2 out of it. THEN Ryan and I both agree we will be switching to the more 'adult' yard with a pergola in the middle of the yard. This is our yard now (the slide and the deck around the pool are gone though). Underneath the pool is a sand base so to convert from this into something like the pictures above it would just be a matter of putting a stone base and walk way. AND if Ryan has his way a bridge... Ryan has a secret wish to build a bridge... and I'm fine with letting him build a bridge over our imaginary river to get to our wonderful outdoor living room. Now here is what the rain storm did to our gazebo last year!! Isn't it a miracle that they fixed it!!!! It literally just crumpled under the weight of the rain!! Anyway, the ultimate plan is to get rid of the interlocking brick that is around the pool on the right side and put all grass. Then once the pool is gone we will fill the sand pit with the interlocking brick (keeping the hostas around the area to add flare) and build a pergola in the middle of the yard. Then get rid of the gazebo and move the patio furniture under the pergola. 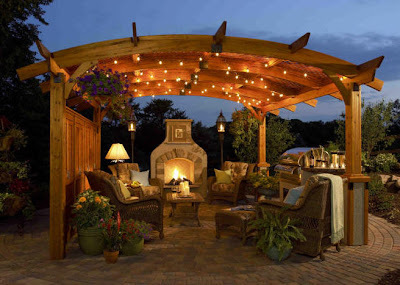 If you love the pergola as much as I do you can find plans to build one here at Rona!